Teenagers who heard the Wilson brothers—better known as the Beach Boys—harmonize on their big hits, “Surfin’ Safari,” “I Get Around,” “California Girls,” and “Good Vibrations” in the early 1960s, probably haven’t forgotten them or their largely wholesome lyrics and lilting melodies. The three brothers—Brian, Dennis, and Carl, along with cousin Mike Love and friend Al Jardine—memorialized girls, boys, cars, and the beach. For the Beach Boys, it was always summer, always Christmas, always Disneyland. Album after album, year after year, they put Southern California on the map of rock ’n’ roll and gave adolescents in the era of Camelot a soundtrack that reflected the youthful innocence of the early Kennedy years. Then came the assassination in Dallas, the arrival of the Beatles, the Rolling Stones, the San Francisco sound, and while the boys managed to evolve—the album Pet Sounds (1966) is a minor masterpiece—and remained popular, they never produced an album as majestic as Sgt. Pepper’s Lonely Hearts Club Band or had the staying power of Mick Jagger and the Stones. I heard the Beach Boys perform once, in the late 1960s, and went backstage to meditate with Mike Love, who had embraced Transcendental Meditation (TM), which was popularized in the west by Maharishi Mahesh. Even then, nearly 50 years ago, the band had lost much of its élan, though it boasted devoted fans. Dennis and Carl Wilson are dead. Mike Love still performs, as does Brian Wilson, now 74, who has just written and published, with help from reporter Ben Greenman, a second memoir, titled I Am Brian Wilson. The first, Wouldn’t It Be Nice: My Own Story came out in 1991. A decade and a half later, Wilson doesn’t make as nice as he once did, though his book emits some good vibrations. I Am Brian Wilson reads like it was spoken off the cuff into a tape recorder and then edited; it feels immediate, informal, and confessional. It’s not chronological, but follows the meanderings of Wilson’s own mind as he jumps around and slides backward and forward. “Time jumps and sometimes time lands,” he says. This books lands nicely again and again. Behind the wholesome image of shy boys and cute girls in a world of eternal sunshine, the Beach Boys inhabited a much darker reality. Brian Wilson nails it in his latest memoir. By his own admission, he was a very sick man, indeed: depressed, paranoid, fearful, overweight, and insecure. His own personal physician, Dr. Eugene Landy, seems to have been a control freak and a kind of moral monster who only made his patient sicker and sicker, though why Brian didn’t immediately sever ties with him he doesn’t explain. The 2014 biopic, Love and Mercy, traces their weird relationship and stars Paul Dano as the young Brian, John Cusack as the older Brian, and Paul Giamatti as Eugene. Large parts of I Am Brian Wilson are predictable. After all, when you read a memoir about a rock star, you expect tales of drug abuse. Not surprisingly, Wilson talks about marijuana and LSD. But there are also heartfelt accounts of his love for his two wives, Marilyn and Melinda, his seven children, and the music that he made that kept him sane, kept him creative, and probably saved his life. The memoir veers from a kind of self-loathing to self-loving. All the way through the book, Brian struggles to capture the essence of his father, Murry Wilson, who managed the band in its early years, and who loved his sons and who also abused them physically. Brian says his dad whipped him. One might call Murry Wilson the fourth Beach Boy. Then there’s Brian’s complex relationship with cousin Mike Love whom he depicts as a kind of egomaniac. The two men clashed off stage and in the courts over money and copyright issues. Reading I Am Brian Wilson can be painful as the author peels away one layer after another to reveal an inner realm inhabited by demons. For years, Brian heard voices that may have helped him write songs and compose music, but that nearly crushed his fragile soul. In the chapter titled “America,” which comes near the very end of the book, Brian pays homage to Disneyland, which he calls more American than America itself, and the White House, too. Indeed, Ronald Reagan and George W. Bush both invited the Beach Boys to play for them. One can understand why. There isn’t a single song in their entire repertoire as dark and sinister as “Sympathy for the Devil” or as ominous as “Bad Moon Rising” by Creedence Clearwater. There’s never a doubt about Brian’s patriotic spirit, but he also says that fans in Australia and the UK “have more love for American music than American audiences do.” That’s sad. 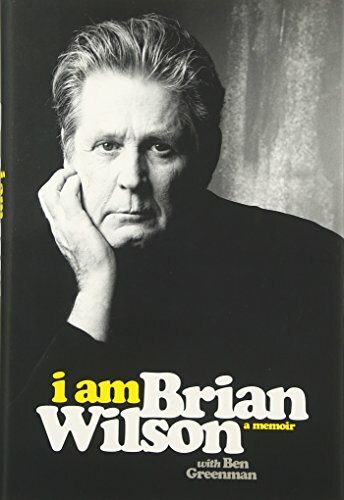 Perhaps the sections of the book that are the happiest are those in which the author describes his own creative process and his genuine love for other rock ’n’ rollers, including Paul McCartney, Bob Dylan, and Phil Spector, who appears throughout I Am Brian Wilson. If, as the author says, an album is “a kind of book,” then this book is a kind of album. Then, too, if, as Brian observes, all the songs on the early Beach Boys albums “seem like one big song,” the chapters in I Am Brian Wilson seem like one big scene that’s infused with romance, nostalgia, and a near-constant need for acceptance and recognition. Reading this memoir, one can’t help but hear in the background 1960s classics like “Fun Fun Fun” which has a great beat and makes you want to get up and dance, whether you’re 16 or 64.